My parents and siblings were already in Puerto Princesa City days before I arrived. I purchased another ticket as it is more costly to rebook one, for me to be able to join them one weekend in celebration of Father’s Day. As we currently live independently from one another, special occasions and trips such as this serves as our reunion. And the wanderlust in me is even more excited by the fact that my mother has already pre-arranged a tour to the UNESCO-inscribed Puerto Princesa Subterranean River National Park. And Yes, I haven’t been there. A visitor entry permit is necessary before one can explore the national park and the same can be applied at the City Coliseum Puerto Princesa Underground River Office. Inform them beforehand of the intended date of tour as they recently limit the number of visitors per day to the underground river. The rented van collected us at around 7 in the morning at Marianne Hotel. For the sleepyheads that we all are, it is unusual for me and my siblings to wake up early but we have to succumb for the fixed schedule of the tour and besides, travel time to Sabang Port is an approximate of two hours from Puerto Princesa City. En route to the Sabang Port, we made a stopover at the Karst Mountain Elephant Cave, with pit stop markers for the Amazing Race series in the Philippines and Ukraine. The vast rice fields surrounded by karst mountain formations is a treat. Arriving at the Sabang Port, we presented our Visitor Entry Permit with attached valid Identification Cards (a must) for confirmation of schedule and consequently, register at the Tourism Information Center. The queue for the motorized bancas that will take visitors to the underground river docking area is well-organized. After registration and payment of necessary fees and boat rental, visitors shall wait until their number is called. The sun was up on that Saturday morning. Being a weekend, there were a lot of tourists on queue but less I suppose since we came early as compared to the late afternoon schedule. It took us 30 minutes to reach the docking area to the underground river. 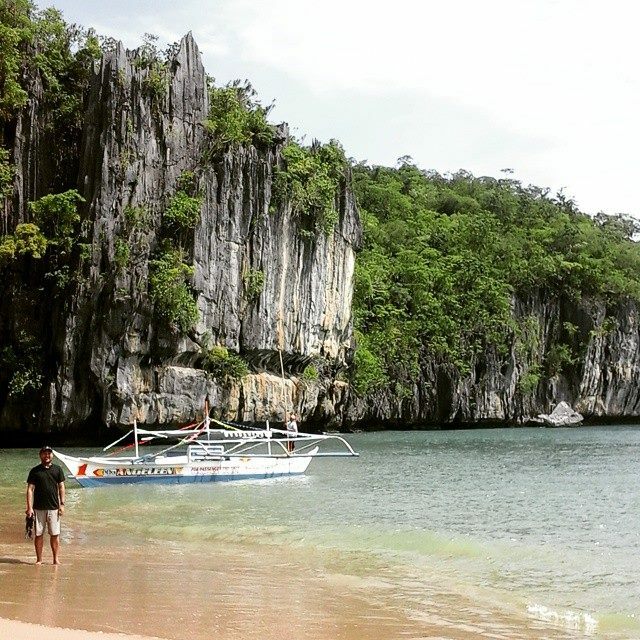 The towering limestone karst formations that surround the beach was picturesque. 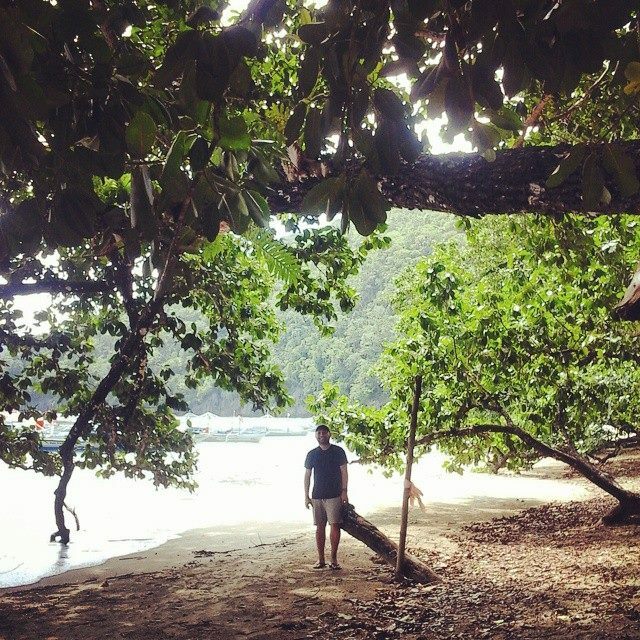 There are two ways to reach the underground river, either a short hike or a boat ride from Sabang Port. Without too much thinking, we opted for the latter. A short hike is relative and even without time constraints, I would still opt for the boat ride. The national park represents a habitat for biodiversity conservation. Even before entering the Puerto Princesa Underground River, there are mammals and reptiles near the shores. The long-tailed macaque are just everywhere, some feed themselves on trash bins while others wait to grab food from visitors (beware!) and I also saw a monitor lizard freely roaming around. But these are all safe and maybe used to human interaction. Visitors should bring their permit at all times, otherwise, you won’t be allowed to board on the canoe directed towards the underground river. Visitors are provided helmets and life jackets as a safety precaution. Swimming is definitely not recommended as there is a strong underwater current aside from its depth. A few walks from the registration area for the paddle boat underground river tour, there is a boardwalk leading to the canoes under a canopy of rainforest trees. Each boat is assigned a tour guide and you will be definitely amazed of how knowledgeable they are of the formations, stalactites and stalagmites despite the total darkness in the absence of a flashlight. My father volunteered to hold the flashlight in our case. St. Pauls underground cave features stunning formations of stalactites and stalagmites and is considered one of the largest cave rooms in the world. The only source of light is the flashlight as we cross the river. We were initially greeted by a number of bats and balinsasayaw birds (cave swiftlets). The humming of the birds is a perfect introduction of the underground river. Then came a lot of rock formations ranging from a naked woman, vegetables, horses, smokey mountain replica and a lot more. The guide is well-versed that he knows when to direct the flashlight at a certain direction. The 1-hour underground river tour is quite educational. Since 1992, it is the City Government of Puerto Princesa managing the national park. That was the last statement I can decipher from what our tour guide was saying. Minors below 2 years old are not allowed inside the cave. In my quest to visit the UNESCO World Heritage Sites all over, I have always raised my concern on why there is a distinction for local and foreign visitors’ fee. In the Philippines, it is only the Puerto Princesa Underground River that imposes fees which made me conclude by way of comparison that this must be a standard for all UNESCO sites that comes with admission fees. From the time the Puerto Princesa Subterranean National Park has been officially adjudged one of the New 7 Wonders of Nature in the year 2012, rates I suppose might have increased but for preservation, visitors are likewise restricted in number. As we end the tour, the emerald green water that surrounds might not have surfaced due to the inclement weather but the new experience shared with the family is something to be treasured and remembered. Should I revisit this UNESCO Site? Once is enough.